A Latin expression said and I quote "Nemo dat quad non habet" It simply means that you can not give what you do not have. In every society around the world, there are duties and functions attributed to any well recognised Human Rights Organization or Group as the case may be. It is very clear that the works of every Human Rights Organizaion has limitations, but it is very worrisome to see that the case is far different from the so called Human Rights Organizations we have here in our society, as shown by Intersociety group and some other self aclaimed Human Right Organizations, specifically with the regard to the recent meddling in the activities of IPOB on the struggle for the restoration of the sovereign state of Biafra under the leadership of Mazi Nnamdi Kanu the director of Radio Biafra, Biafra Television. 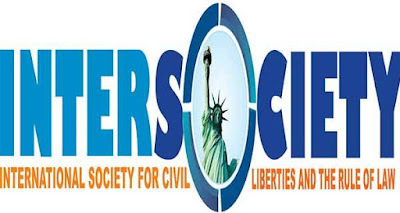 International Society for Civil Liberties & the Rule of Law, I think has gone beyond their boundaries, by deliberately accusing an individual without forensic evidence, and who they ought to be protecting his human rights. One would ask when has the duties and functions of International Society for Civil Liberties & the Rule of Law turned to gossiping and blackmailing innocent citizens that ought to seek for their advocacy? One should also be compelled to ask if Intersociety is being sponsored by the Nigerian politicians in their quest to thwart the efforts of Mazi Nnamdi Kanu and IPOB in restoring Biafra, with the recent accusations levelled against Mazi Nnamdi Kanu the leader of Indigenous People of Biafra of receiving the whooping sum of $50 thousand and SUV Jeeps from the incumbent governor of Anambra state, Chief Willie Obiano, as contained in a publications on 2nd June by the Nigerian media syndicates. This is in no doubt the activities of enemies of Biafra restoration, who have vowed not to stay alive and watch the kingdom of God on earth- Biafra being restored and this groups of miscreants will be paid according to their work. The Indigenous People of Biafra is thereby urging the general public to disregard this people or any other group saying or publishing all kinds of junk in the media against IPOB and her leader Mazi Nnamdi Kanu because they are agents of the contraption called Nigeria, knowing too well that Kanu did not receive any money from Governor Willie Obiano who ordered for the massive killings of the IPOB youths in Nkpor Anambra state during the 2016 Biafra fallen heroes and heroines remembrance day by the Nigerian joint security forces and several similar cases in the state. Maybe, it did not come to their notice that Mazi Nnamdi Kanu boycotted the same Willie Obiano from paying the hospital bills of IPOB members that was injured in Anambra state, because the ugly situation did not happen without his orders and it is inhuman that he could not avert it from happening in his own state. Besides, what is fifty thousand dollars and SUV jeeps to compare with what the Nigeria government offered to Mazi Nnamdi Kanu in other to give up in the struggle for the total restoration of the sovereign state of Biafra, which he bluntly rejected stating categorically that "it is either Biafra or death". It could at the same time interest the general public if this so called Intersociety group or even their sponsors will provide vivid evidence, that Mazi Kanu received all the above mentioned items from governor Willie Obiano, and I wonder if that is going to happen because this is what they are doing for their masters who gives them their own share of the national cake which will soon seize the moment Biafra is being restored.